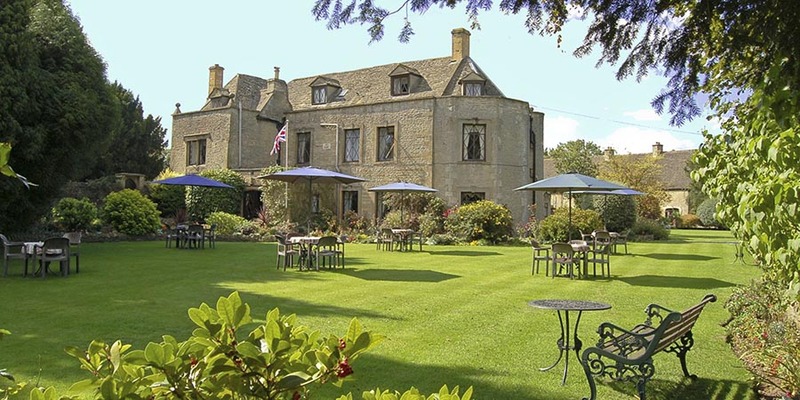 ﻿ Hotels in the Cotswolds - Welcome to Stow Lodge Hotel - Find us. The Hotel is situated in the centre of Stow-on-the-Wold and has three entrances to the Hotel. One entrance from the Town Square, and two entrances from the A429. We do recommend that you use one of the two entrances from the A429, as the entrance from the Square is quite narrow in parts. If using Sat Nav, the Postcode for these entrance's , is GL54 1DW. You will pass through Moreton-in-Marsh, which is four miles from Stow-on-the-Wold. As you enter the town you will meet the first set of traffic lights,with Tesco on the you left. Go straight over these and again straight over the second set of traffic lights that are approximately 100 metres further on. The hotel entrance is on your left approximately 100 metres past the second set of traffic lights and just before a third set of traffic lights. The A429 from Bourton-on-the-Water and A424 from Burford meet at a junction approximately one mile from Stow-on-the-Wold. Follow the A429 up the hill into the town, passing a petrol station on your left. Go straight over the first set of traffic lights and the hotel entrance is the first turning on the right approximately 40 metres past these traffic lights. As you enter Stow-on-the-Wold, continue on the A436 through the town until you meet the junction with the A429.At the traffic lights, turn right onto the A429 and the hotel entrance is the first turning on the right, approximately 40 metres past the traffic lights. The A424 and B4077 meet in Stow-on-the-Wold. There is a set of traffic lights, approximately 75 metres after the junction of these two roads. At the traffic lights , turn right onto the A429. The hotel entrance is approximately 100 metres further on, on your left, just before a second set of traffic lights. FROM THE WEST - B4068. At the junction with the A429, turn left at the traffic lights. The hotel entrance is the first turning on the right, approximately 40 metres past the traffic lights. The Station is situated approximately 4 miles from Stow-on-the-Wold and has direct links to London Paddington, Oxford and Worcester. The company operates from Bourton-on-the-Water and has direct links to Moreton-in-Marsh, Cirencester and Cheltenham. We highly advise that you pre-book your taxi. It can be difficult to book one last minute.